What weather can you see out of your window ? How's your garden doing ? Sun ? Rain ? Hot ? Cold ??? Lol. 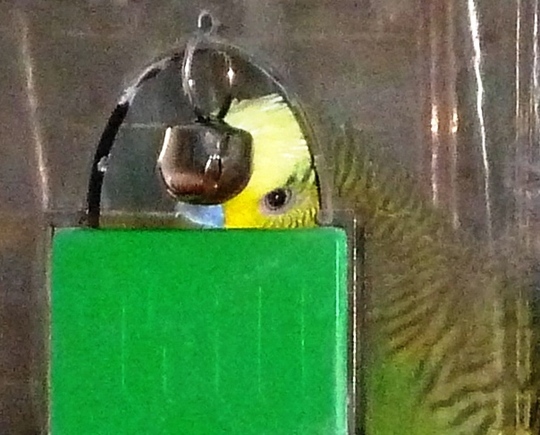 I've told him to hang on to his feathers ..
That's his "cage extension". He plays in there for hours. It's an old budgie bath, and he likes to chuck toys from there onto his cage floor, where they land with loud crashes and bangs. Lol. It's you Annie ... Lol. Hi Carol ... Glad you had a lovely day yesterday. Lashing down here now...grey all day and really bitter wind. Yesterday sleet, snow, hail and rain...oh and sun..but no sun today, just grey and cold. Really, really wish it would warm up a bit now! Hi Crocus...you look like I feel! Not been too bad a day here, been busy in the garden, but the air is sooo cold, you're in the best place Crocus, keep warm....tweet! Hi Janey ... Thanks for tweeting ..
Hello Karen .. Let's hope for warmer weather soon ! Lol. Does Crocus speak? I remember one day I went to the vet with my guinea pig for ultrasound examination (I am laughing until now). So we sat with my piggy (eating-as usual- in her travel box) in a corridor full of patients. There were people with cats, rabbits, birds, snake, but mostly dogs. Then entered the corrdor a slim guy with green parrot in cage. He sat down, put the cage on the floor and opened the doors on it. Parrot jumped out and started to walk along the corridor, observing all animals and people. It looked very funny and the parrot very healthy. So I turned to his owner and asked him:"He looks very healthy. What´s wrong with him?" The answer was: "He stopped speaking with me and my wife." LOL. Hi Karen! :) No, it was angina! Actually it was fantastic dictionary that parrot had. For instance, I was told that every morning he had breakfast with his owners. He was speaking wth them like this "Is that orange tasty? Do you like it? I will like it too!" I think that saying very much applies to May this year. (Apparently Neena will understand ...) Lol. In Bude today, the heavens opened and it poured and poured. We sat in the car for 20 minutes before daring to venture out in it! People and their dogs were absolutely drenched - unbelievable!!! Wow. That must have been a definite downpour ! Sensible to stay in the car till the wet weather eased a little. Crocus has this older bath fixed onto his cage all day, for his party pad with his toys, and then I fix a different newer bath on for when he wants a splash about. Mop Top is a lovely name for a canary .. but maybe he isn't such a party bird as Crocus.. LOL. Couldn't work out what this picture was from the small one Terra, sweet little budgie. Hello Crocus..... For my fifth birthday, (A very long time ago) I had a yellow budgie, bought from the local coalman who had an aviary full of them. Called him Gypsy, and he used to ride on my sisters wooden toy that was a donkey and cart and the donkey went up and down and so did Gypsy, sitting on it's back as the cart went along. Is Mop Top a Gloster Canary ? I love those ... they look like they have "Beatle" hair styles.. Lol. I hope the weather improves... was certainly a very rainy start to Monday in most parts of England ! Great picture of Crocus in his party pad lol... I wish my two would play with their toys instead of nibbling my ceiling coving all day. Is crocus listening to the weather forecast on a green radio? Or is it a mirror? A parrot with angina....that's different!! I can just see him with those sticky bits all over him, attached to the ECG machine. Rain all night here in Essex and heavy at times. Dry today and warmer too. Sunshine since about 3pm...so must not grumble. Hope all that water will fill up the stores faster than all those miserable experts keep telling us. Hello Poppy ... that's good you like your new cage. Thanks Bill ... Crocus is partying again this evening. I can't keep up with that pace ... bells, glitter balls, mirrors .. exhausting ! Crocus has all the up-to-date equipment for weather forecasting .. his latest predictions are that conditions will be changeable .. The 'Save the Dingsite Duo' wont work Terratoonie, they quite blatantly sit on the curtain rail nibbling away with grins on their beaks. They are having a domestic right at this moment on who's sleeping where under the cover hanging onto the side of the cage instead of sitting on the swings. I wish they were like crocus and partying with each other late into the night but nope they are arguing and squawking away. I'll post a picture of them. Crocus is very lucky because his budgie mirror reflections are always in agreement .. in the same mood, same colours .. so no arguments here. TT did you mean party pad or ipad? lol I can see the padlock also, do we all see different images on our pcs do you think, he sound a fun bird to be around. I sometimes put my iphone in the cage for Buster and Bertie and let them watch iplayer..
Just got back from cold damp Britain to a temperature of 30 degrees! But .... it's not been good while we were away. Neighbours tell us it's been raining almost non-stop complete with thunderstorms and huge hailstones! Budgie had better stay tucked up! Hello Nariz ... Thunder and hail ... oh no ! I've given Crocus your advice and he's staying cosy. We have winds and rain here too ! The thumbnail photo on my homepage was undecipherable so I had to come along & see the big one! Crocus obviously enjoys himself in his pad with all mod cons! Looking out the window this morning was pretty depressing with cold Northwest winds & rain all morning . This afternoon it began to get better then we had a heavy shower. Now the sky appears to be clear. We can expect some sunshine tomorrow but some heavy showers are also forecast. It seems that Wednesday will be the best day this week. My wife & I were in Spain for a few days last week & the weather was nothing to write home about either! We went via Valencia for the first time ever & the weather there was gorgeous! We were there just half a day, en route to Cuenca. Saturday was rather overcast & cool & during the night there was some rain. The rest of the time we were there the weather was the same except we had no more rain. When we left Cuenca on Wednesday to return home the sun finally came out & the day was scorching when we left on the coach at noon. When we got off the plane at Stansted it was cold & raining! Welcome to "Old Blighty"! Yes... Wednesday and Thursday will be the best days ... before more rain on Friday and Saturday. Crocus is ignoring the weather and playing with his mirrors, bells, and ladders !